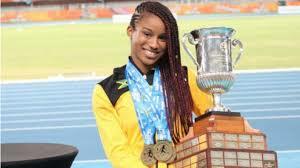 KINGSTON, Jamaica — Briana Williams, the Under 17 girls sprint double champion at the 47th CARIFTA Games that was completed earlier this evening at the Thomas A Robinson stadium in Nassau, Bahamas, was named the Austin Sealy Award winner for her outstanding performances. Williams, who just turned 16 years old, won three gold medals, the 100m in a new championship record 11.27 seconds on Saturday and then took the 200m earlier today in 23.11 seconds, the only sprint double champion over the weekend. On Sunday, she also led the Under 17 girls’ 4x100m team to a championships record 44.95 seconds to erase the 45.05 seconds set by another Jamaican foursome in 2009. Sashieka Steele, Serena Cole and Tia Clayton ran the other legs as they broke the record that was set by the team of Janieve Russell, Deandre Whitehorne, Shericka Moulton and Shericka Jackson. The Florida-based Williams is the first Jamaican, since Yohan Blake in 2007, to win the prestigious award given to the most outstanding athlete at the championships. Jon Jones in 1979, Andrea Thomas in 1985, Michell Freeman in 1988, Inez Turner in 1991, Claudine Williams in 1992, Nikole Mitchell in 1993, Roy Bailey and Aleen Bailey in 1997, Veronica Campbell Brown in 2001, Anneisha McLaughlin in 2002, Usain Bolt in 2003 and 2004 and Theon O’Conner in 2005 were the other Jamaicans to win the award.